He watched her from across the hall, his eyes following her every move. Damn, she was beautiful! And she carried herself with the natural confidence of someone who knew she was beautiful. He wasn’t the only one watching her either. Men sitting next to their wives turned their heads as she walked past, but were careful not to look for too long. Young men sitting together nudged each other and stared openly. They were at a wedding. He hated weddings. But his wife had dragged him along all the same, as usual. It seemed to him that not one Saturday could ever pass in Lagos without someone she knew getting married. It was funny how her friends always became ‘their’ friends whenever another wedding was imminent. The only good thing about weddings, as far as he was concerned, was the chance to feast his eyes. There were women everywhere! Young, old, middle-aged, light-skinned, dark-skinned, orobo, lepa, married, single… any type you liked. He was fond of all women. He didn’t have an exclusive type. He could find something to appreciate in any woman. He considered this a gift he had been blessed with. His eyes wandered back to the woman he had been watching. She was exquisite. Her hair was natural and short; not long enough to be an afro, but not short enough to see her scalp. She was in her late thirties but could easily claim to be twenty-eight and get away with it. He decided it had to be down to her skin. She had beautiful, glowing skin that belied her age. Her generous hips swayed as she walked, her long flowy Ankara dress unable to do anything to disguise them. For a woman that age with hips like that, her waist was surprisingly small. Her bare shoulders were radiant and trim, and her neck looked long and delicate with no Brazilian weave to obscure it from view. He licked his lips involuntarily, and imagined himself behind her, planting a tender kiss on the spot where her neck met the back of her head. His four-year old son Nnanna ran up to him and hugged him, then clambered unto the empty seat next to him. Rose, their house help, hovered a few metres away, unsure whether to leave the child to his father and go off, or stick around in case she was needed. Someone placed a hand on his shoulder and he looked up. It was his wife’s best friend Tolu. She was a very stylish woman in her late thirties; pretty albeit in a slightly mousy way, and impeccably groomed. She always smelt expensive. Ebuka sometimes worried that she did not eat enough. Nobody was supposed to be that thin after four children. Tolu’s accent was one-third British from her time in boarding school, one-third American from her time at university, and one-third Nigerian from... well, because she was Nigerian after all. He often teased her that she should make up her mind and choose one accent. Grumbling half-heartedly, Nnanna ran off to join the waiting Rose a few tables away, and they set off together to locate his twin older sisters. Yes, o. Peace and quiet at last. Where was he again? Oh yes! He scanned the reception hall, looking for the woman with the short hair. His phone rang, interrupting his search. He pulled it out and examined it. Caller ID said ‘Nekky’. He put it on silent. He really didn’t have Nekky’s time right now. Thank God Ojiugo was safely far away. She would most certainly have snatched his phone and answered it herself if she had seen the name. 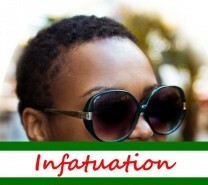 This was first published as Infatuation by Obinwanne on Naijastories. And you can read the full story there. If you love the work of the writers, support us by buying the first Anthology. Naijastories.com is the leading community for Nigerian writers and book lovers, combining elements of a writing critique website and a social networking site. Of Tears and Kisses, Heroes and Villains is Volume 1 of the 'Best of NaijaStories' series. The 30 stories featured in this anthology were all originally published on this website between March 2010 and March 2011.